M T D J u n e 2 0 1 8 12 N e w s / V i e w s Tire Rack has a new app The new Tire Rack Garage app offers reminders to check tire pressure, including seasonal adjustments, plus tire rotation, tread depth, balance and alignment. KYB is honored KYB Americas Corp. has received the "sales representation support vendor of the year" award from the Automotive Parts Services Group. TIA has a new video The Tire Industry Association (TIA) released a new video during National Tire Safety Week. 'Tire Safety Starts With Inflation' is the latest entry in a series of consumer education videos. Corvettes are top prize The Aftermarket Auto Parts Alliance presented car keys to the three grand prize winners of the Kentucky Horsepower Cor- vette Giveaway sweepstakes in May. The three Stingray Corvettes were provided by Auto Value and Bumper to Bumper stores. Tire recall service is offered Software provider Tiremetrix LLC provided tire dealers and auto service providers with a free web-based database to check for tire recalls and tire aging issues during National Tire Safety Week, May 21-28, 2018. Bauer Built helps 6 scholars Bauer Built Inc. awarded six scholarships to high school seniors in memory of its founders, G. F. "Sam" and Ethel V. Bauer. Each of the winners will receive $1,500. Ware joins TCG Tire industry veteran Bruce Ware has come out of retirement to join Tire Consultants Group LLC (TCG), where he will oversee sales, marketing and merchandising initia- tives. His experience includes leadership roles at TBC Corp.'s Big O Tires, Falken Tire Corp. and Nitto Tire U.S.A. Corp. The Group golfs for toys Members and vendor partners of the Automotive Parts Services Group (The Group) helped raise over $350,000 for the U.S. Marine Corps Reserve Toys for Tots campaign at The Group Toys for Tots Golf Tournament in Grapevine, Texas. 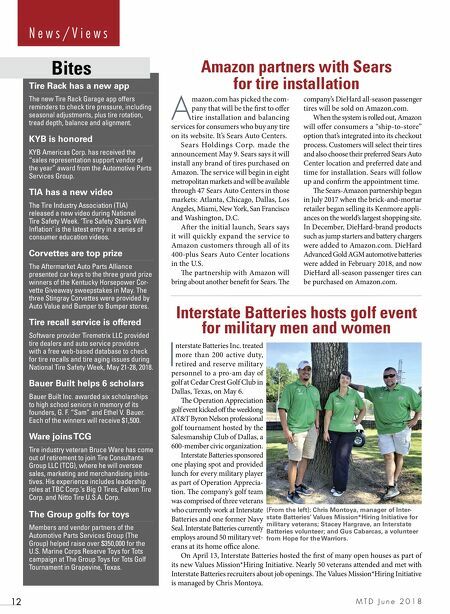 Bites Amazon partners with Sears for tire installation Interstate Batteries hosts golf event for military men and women A mazon.com has picked the com- pany that will be the first to offer tire installation and balancing services for consumers who buy any tire on its website. It's Sears Auto Centers. Sears Holdings Corp. made the announcement May 9. Sears says it will install any brand of tires purchased on Amazon. e service will begin in eight metropolitan markets and will be available through 47 Sears Auto Centers in those markets: Atlanta, Chicago, Dallas, Los Angeles, Miami, New York, San Francisco and Washington, D.C. Aer the initial launch, Sears says it will quickly expand the service to Amazon customers through all of its 400-plus Sears Auto Center locations in the U.S. e partnership with Amazon will bring about another benefit for Sears. 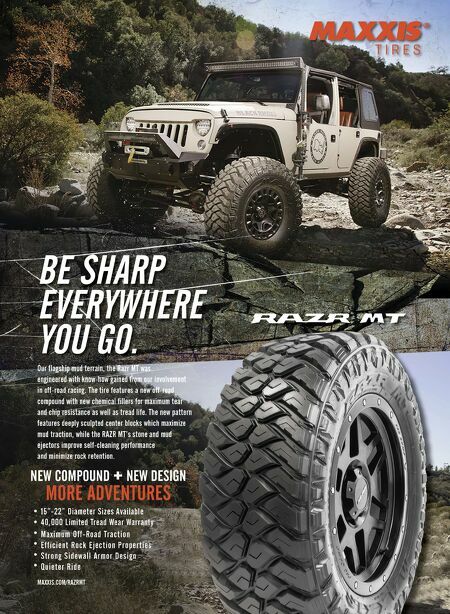 e company's DieHard all-season passenger tires will be sold on Amazon.com. When the system is rolled out, Amazon will offer consumers a "ship-to-store" option that's integrated into its checkout process. Customers will select their tires and also choose their preferred Sears Auto Center location and preferred date and time for installation. Sears will follow up and confirm the appointment time. e Sears-Amazon partnership began in July 2017 when the brick-and-mortar retailer began selling its Kenmore appli- ances on the world's largest shopping site. In December, DieHard-brand products such as jump starters and battery chargers were added to Amazon.com. DieHard Advanced Gold AGM automotive batteries were added in February 2018, and now DieHard all-season passenger tires can be purchased on Amazon.com. I nterstate Batteries Inc. treated more than 200 active duty, retired and reserve military personnel to a pro-am day of golf at Cedar Crest Golf Club in Dallas, Texas, on May 6. e Operation Appreciation golf event kicked off the weeklong AT&T Byron Nelson professional golf tournament hosted by the Salesmanship Club of Dallas, a 600-member civic organization. Interstate Batteries sponsored one playing spot and provided lunch for every military player as part of Operation Apprecia- tion. e company's golf team was comprised of three veterans who currently work at Interstate Batteries and one former Navy Seal. Interstate Batteries currently employs around 50 military vet- erans at its home office alone. On April 13, Interstate Batteries hosted the first of many open houses as part of its new Values Mission*Hiring Initiative. Nearly 50 veterans attended and met with Interstate Batteries recruiters about job openings. e Values Mission*Hiring Initiative is managed by Chris Montoya. (From the left): Chris Montoya, manager of Inter- state Batteries' Values Mission*Hiring Initiative for military veterans; Stacey Hargrave, an Interstate Batteries volunteer; and Gus Cabarcas, a volunteer from Hope for the Warriors.